Author(s) Donald L. Pavia Kriz, George S. Lampman, Gary M. Engel, Randall G.
NOTE: This book is a standalone book and will not include any access codes. 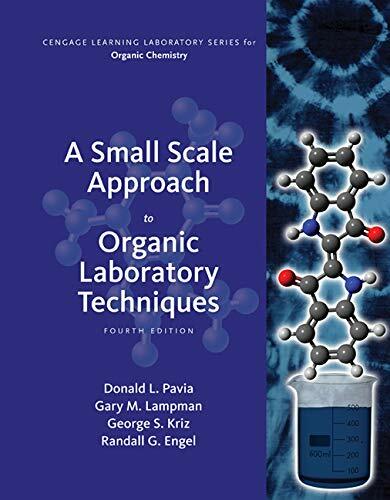 Featuring new experiments, a new essay, and new coverage of nanotechnology, this organic chemistry laboratory textbook offers a comprehensive treatment of laboratory techniques including small scale and some microscale methods that use standard-scale (\"macroscale\") glassware and equipment. The book is organized based on essays and topics of current interest and covers a large number of traditional organic reactions and syntheses, as well as experiments with a biological or health science focus. Seven introductory technique-based experiments, thirteen project-based experiments, and sections on green chemistry and biofuels spark students' interest and engage them in the learning process. Instructors may choose to offer Cengage Learning's optional Premium Website, which contains videos on basic organic laboratory techniques.